“From the instant Taran set foot across the threshold, such a commotion filled the cottage that he scarcely knew which way to turn.” (Alexander 4) and so begins Lloyd Alexander’s last book, The High King, a Newbery Medal winner. I would recommend this book to any classmate with the utmost esteem because of how exciting the book is. 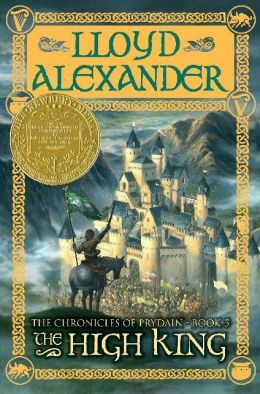 Lloyd Alexander used the prequels in the Chronicles of Prydain series to develop character and plot. In this book The main character, Taran Assistant Pig Keeper, has returned from his quest to find his parents. When he returns to Caer Dallben, he finds that Gwydion, the Prince of Don, has been attacked and the most powerful weapon in Prydain, the sword Dyrnwyn, has been stolen by the Arawn, Lord of Annuvin. The Death Lord, now holding the Sons of Don by the neck, empties Annuvin of its warriors, and Arawn’s army is growing daily. Lords of canters and war leaders rally to both sides building the arms of Prydain and Annuvin. The Armies of Prydain rally to the Castle of Caer Dathyl while Arawn advances his army to Caer Dathyl. The battle is one-sided in favor of Arawn since the largest army in Prydain and the most powerful warlord have sided with the Death Lord. The battle is not a battle, but a slaughter of the warriors of the Sons of Don. The plan Gwydion then launches is risky, but will open Annuvin for attack. Taran’s task is to stop the Cauldron Born, an army of soulless immortal beings, from reaching Annuvin. There are several compelling reasons a person should read this book after completing the books prior in the series. Lloyd Alexander describes everything in such detail and creates an image so accurate that you feel you are about to fall to your death or be killed by a sword blow. Alexander also creatively develops his main characters, and without them, the book would fall apart. My favorite character is the creature named Gurgi that has a minimal vocabulary and likes to link together words that rhyme. One of Gurgi’s favorite things is “crunchings and munchings” which means food. The purpose of this creature is to provide a funny, yet smart and kind character in the book. Gurgi is the light in the dark for his companions on these quests throughout the entire series. He also gives and cares more than a human would for Taran, and he is seen by Taran as a friend and sort of as a brother. All of the other companions depend on Gurgi and his good nature. All in all, The Chronicles of Prydain: The High King is by far the best book I have read all year. I would recommend it to anyone on the planet Earth after reading the other books in the series in order to understand the plot and the characters. Alexander successfully uses descriptive language to move through this action-packed plot. The High King is an action packed book that is fast moving and will keep you on the edge of your seat until you finish.